Praise the powers that be! Autumn is upon us! For a number of reasons, autumn is my favourite season. Firstly, I’m the kind of girl that looks better in layers (by that I mean that I feel more comfortable in a thick cardigan and scarf than I do on a beach swaddled in lycra). The second reason is that autumn brings with it a bumper harvest of all of the best vegetables known to man and I can get creative in the kitchen. Did you ever sing that harvest song at school? “Cauliflowers fluffy, cabbages green, strawberries are sweeter than any I’ve seen,” (sorry for plaguing your brain with that for the rest of the day). Well ever since belting that tune out during assembly, I’ve had a burgeoning affection for all things autumnal. Pumpkins! Butternut squash! Parsnips! You name it, I’m all over it. Like many amateur chefs before me, I’ve done my fair share of experimenting with seasonal veg. However, there’s always *that* one dish that I keep coming to back to. I lived with an American girl at University way back and when and she showed me how to make the best pumpkin pie this side of the Atlantic. Before then, I wasn’t one to mix my sweets and my savories so I was totally dubious but oh my lordy, pumpkin pie is the one! This year, I’m particularly excited to get baking because we’ve just bought a new range cooker (this one!) and I’m dying to try the bad boy out. However, pumpkins aren’t usually in stores until October so I have to practice some restraint. Seeing at it’s almost that time of year I thought I’d share my pumpkin pie recipe with you guys. This is probably not best for a pumpkin that’s been used as a jack-o-lantern. The heat from the candle tends to part-cook the veg and it’ll taste a little waxy. Instead, buy two. One for pie and one for fun. Deseed and roughly chop the pumpkin into pieces and then chuck into a large microwavable bowl and cover with a plate. Heat it in a microwave on full heat for about 15 minutes or until it’s nice and soft. Pour the pumpkin into a colander and leave it on the side to cool down. On a floured work top, roll out shop-bought pastry (unless you want to make it – which I never do) and drape it over the pastry tin. Use your fingers to poke it into the shape of the tin but make sure there’s an overhang. When it’s ready, leave it to chill for 30 minutes. Heat your pretty red oven to 200C/fan 180C/gas 6 and cover the chilled pastry with foil and baking beans. Bake for 15-20 minutes. Remove the foil and beans and then cook for a further 10 minutes or until the pastry is golden. At this point, turn the oven down to 160C/fan 140C/gas 3. Meanwhile, place the pumpkin, sugar, eggs, cream and spices in a food processor, then blend until smooth. Pour into the baked pastry case and bake for 1 hour or until the filling has puffed up in the centre (it will sink as it cools). Remove from the tin and leave to cool. Whip the cream with the maple syrup until thickened. Fold in the pecans and serve spoonfuls of the cream with slices of the pie. Heavenly! 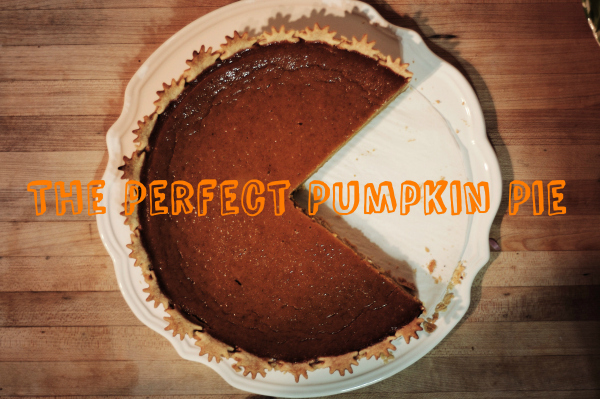 Disclosure: This pumpkin pie recipe is a guest post by Emily Buchanan. Oh my! How amazing. How did you get those pretty leaf shapes on the edges?